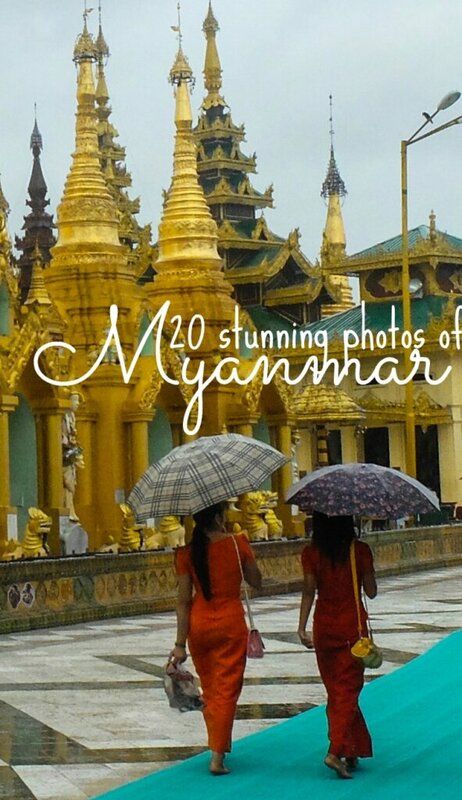 In honor of my short attention span and my rapidly filling one-terabyte hard drive, I bring to you a photo essay of 20 photos from last summer, taken in my one of my favorite travel destinations: Myanmar. 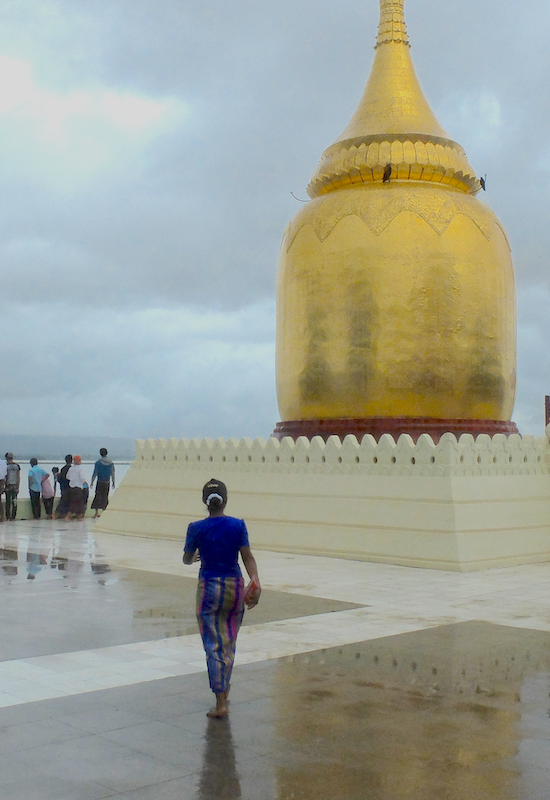 It was rainy almost the whole time I was in Myanmar, but that somehow added to the magic. 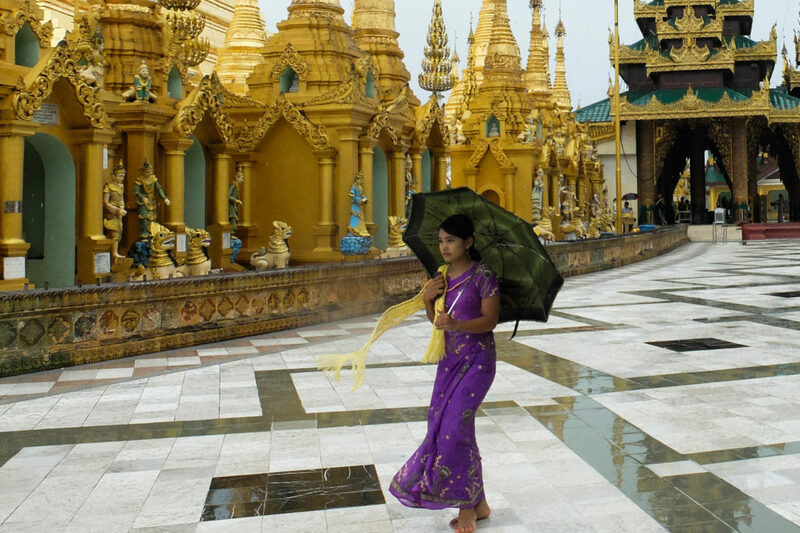 The clothes that the people in Myanmar wear are absolutely gorgeous. 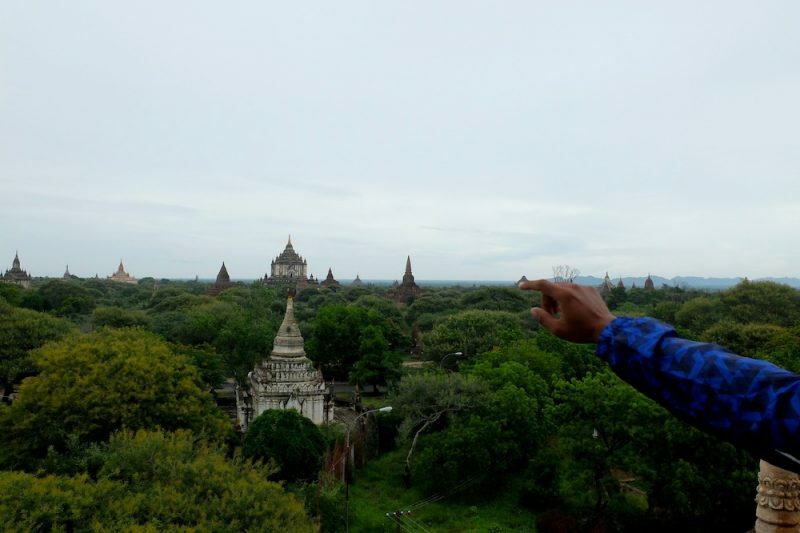 I had read that Myanmar had no wifi, no SIM cards, no ATMs — but journalists and bloggers just can’t keep up with this rapidly developing country. Riding the circle train around Yangon, I laughed to myself when I saw that Myanmar had its own new social messaging app. In fact, I later found out that Yangon is a bit of a techie hub. For all that the country has suffered over the years, the people are resoundingly optimistic. 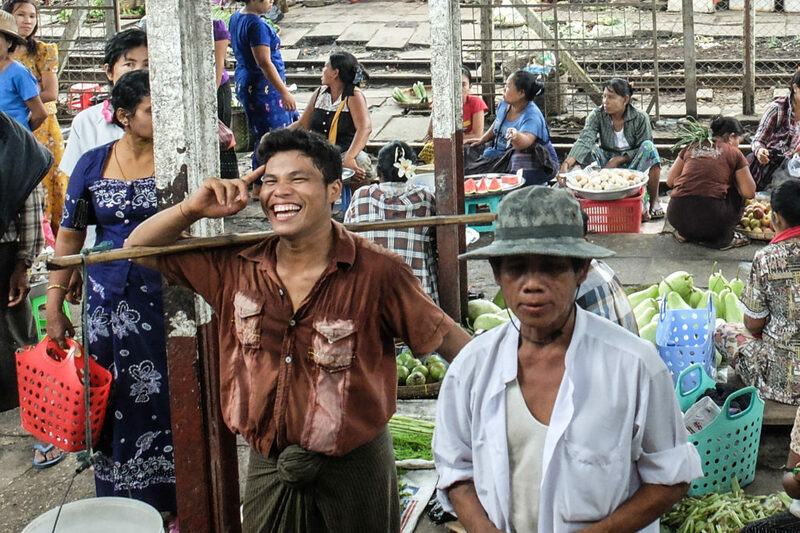 Burmese people are full of smiles, more so than anywhere I’ve ever seen in the world. 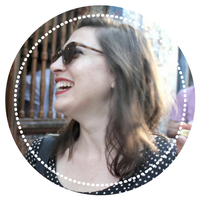 Locals are friendly and always looking to help, whether it be picking up a hitchhiker, giving directions, or advising you on what to see and do. 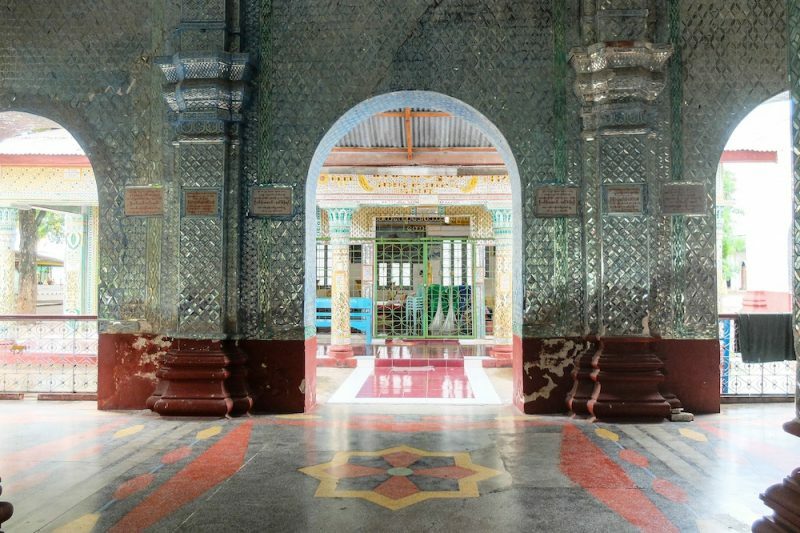 The contrast of modern and old seems somehow organic here in Yangon, a city that manages to keep its soul while reaping the benefits of modernity and – far more importantly – freedom. 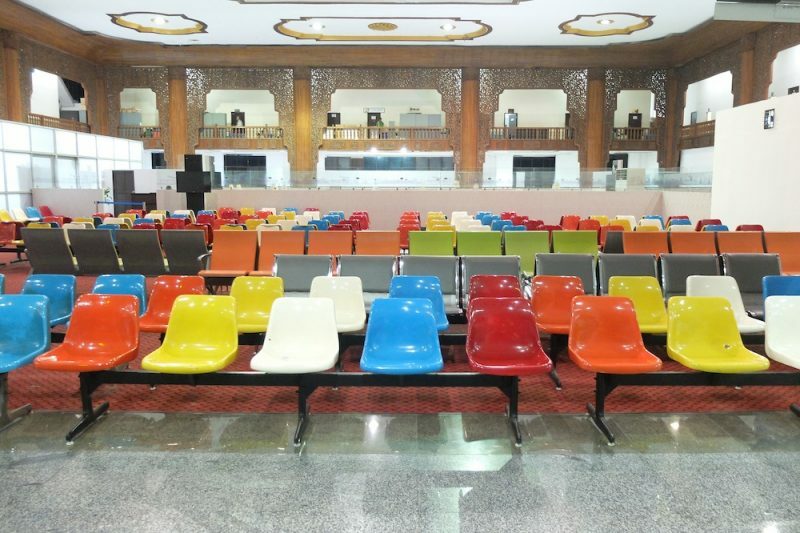 Flying to Bagan, Myanmar’s old capital, was the delightfully dated experience the guidebooks promised, complete with hand-written tickets, a luggage policy more fit for Greyhound than for flight, and these wonderfully retro chairs in the departure lounge. 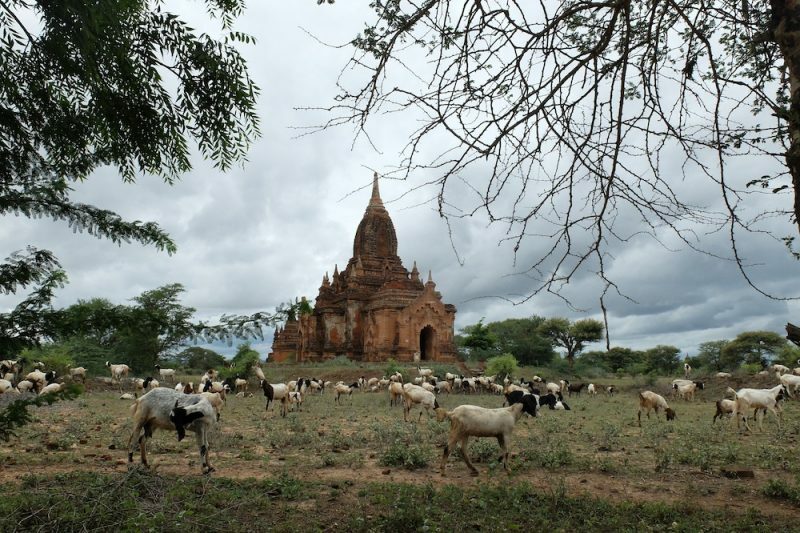 In Bagan, thousands – literally, thousands – of pagodas dot the landscape, becoming almost mundane. 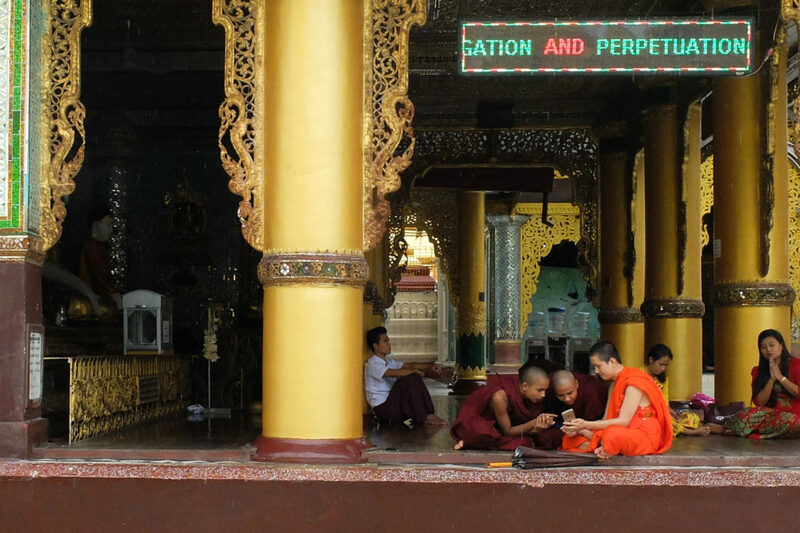 The people of Bagan work together to keep Bagan clean. Locals man the temples, cleaning up after them, providing information about that specific temple to tourists – often hoping for a purchase of a postcard or sand painting in return. 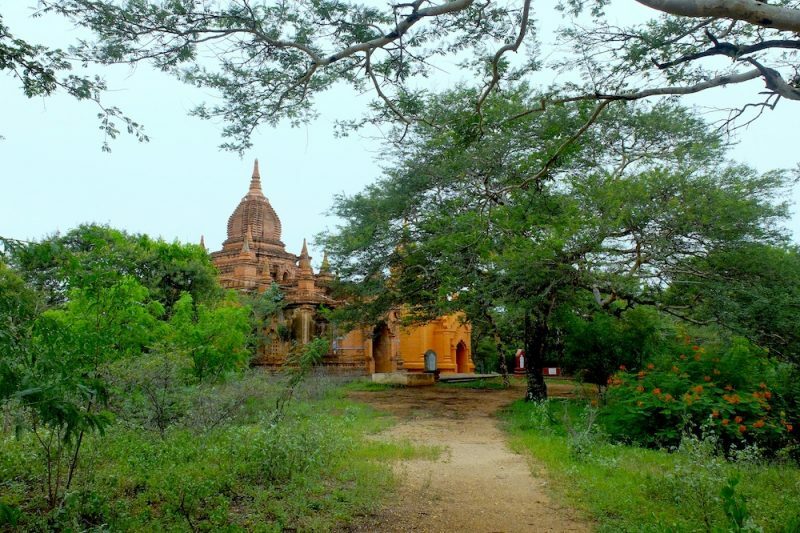 In Bagan, you’ll see other people from Myanmar just as often as you will tourists, paying homage to some of their country’s holiest temples. 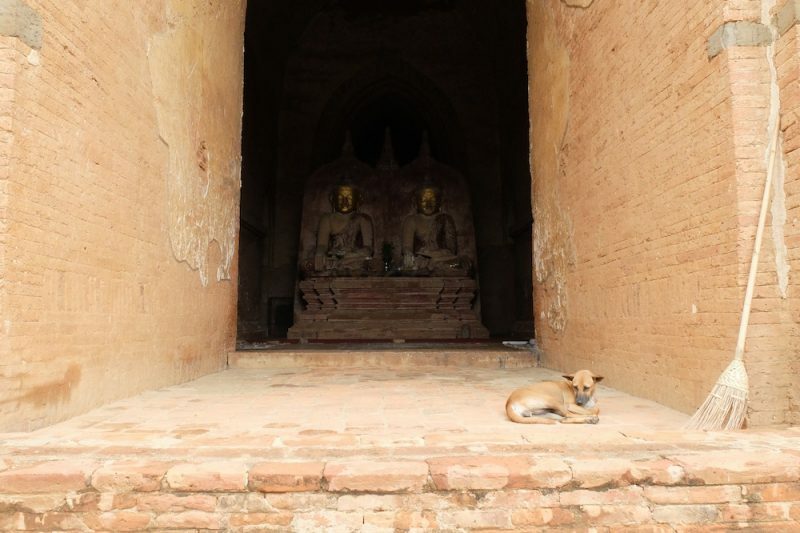 They seem to share the same awe as the tourists: Bagan is a special place. 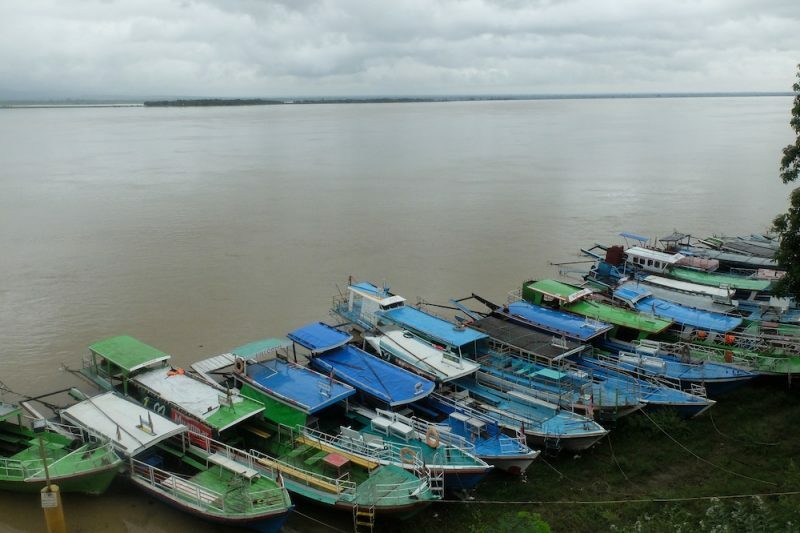 The Irrawaddy river, with its colorful boats, runs through Bagan, an important lifeblood. 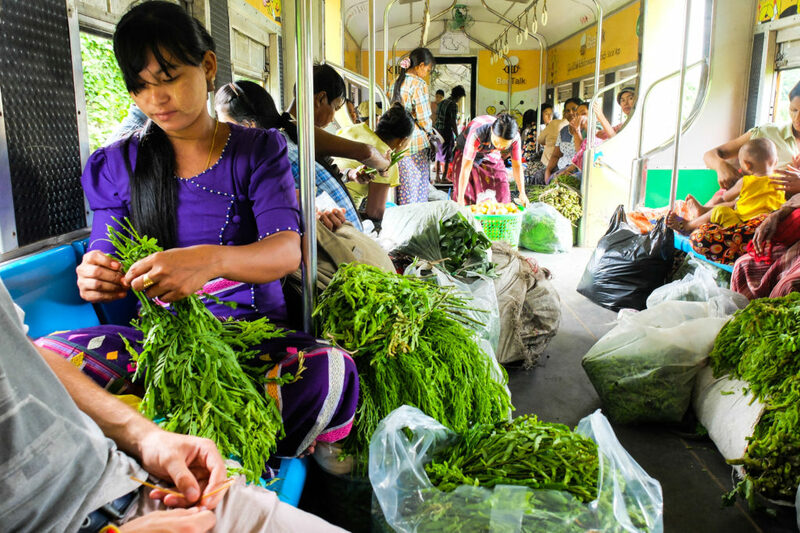 Nearby Nyaung U market is especially dependent upon this river. Around each corner, behind nearly every tree, another unassuming temple. 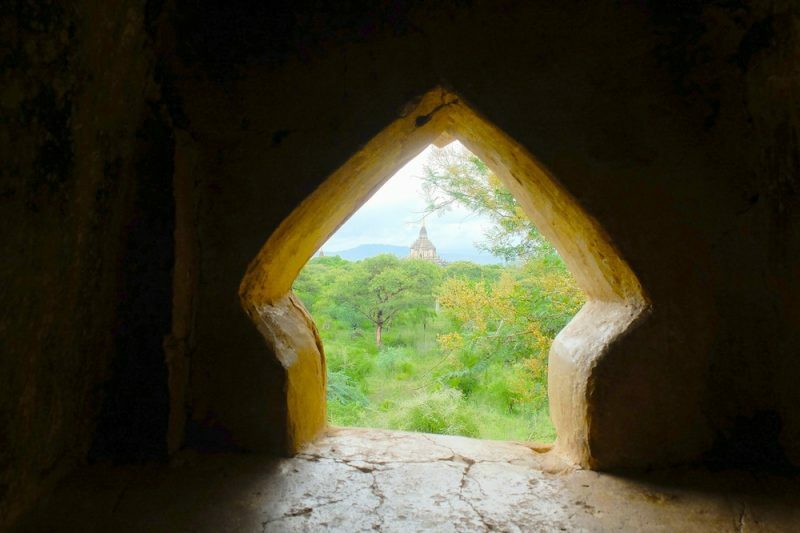 Even through the tiniest of windows, more pagodas and shrines await. 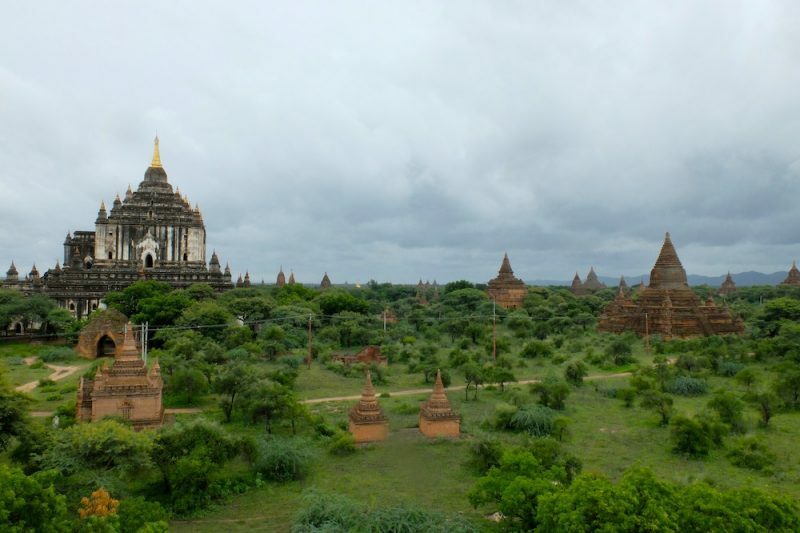 To truly visit each of Bagan’s temples would take a lifetime. It’s an incredibly humbling feeling.The best way to get a sense of the scale is by riding a hot air balloon in Bagan, watching sunrise unfold and illuminate miles upon miles of pagodas. 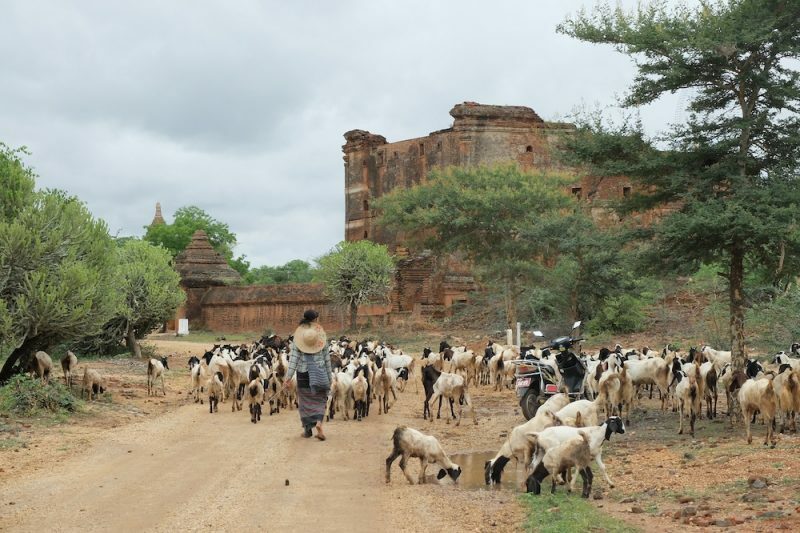 In Bagan’s rainy season, it seems that goats outnumber people. I was the only visitor to this tiny pagoda, which is just one of thousands. But somehow, it felt so special to me, having been all mine for a time. 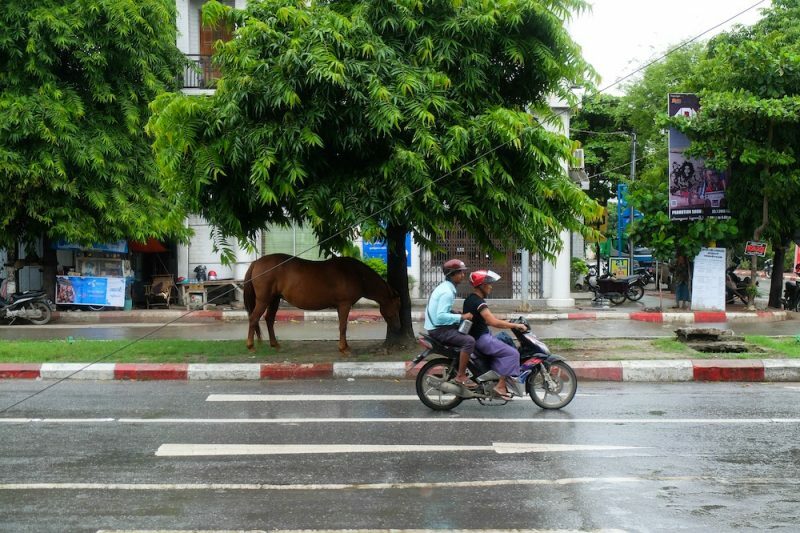 This is as close as it gets to a traffic jam in Bagan. In Mandalay, a mélange of past and present commingle, the new and old somehow merging timelines to create one chaotic, beautiful present. 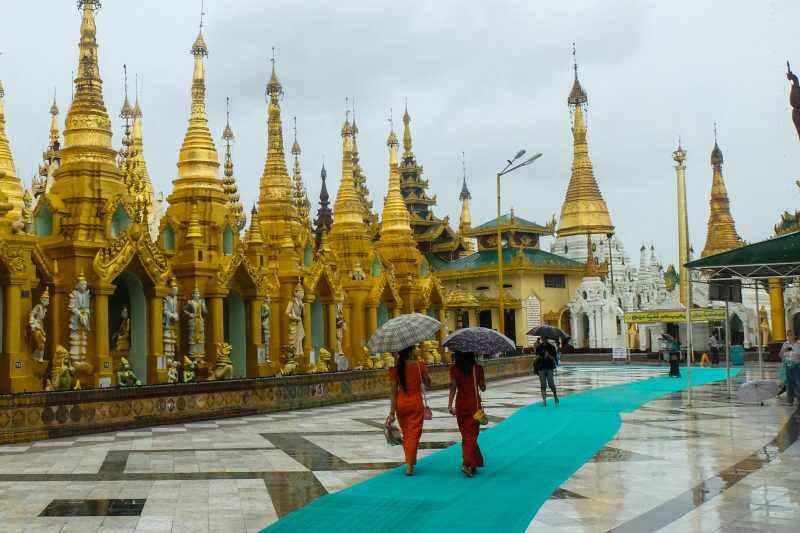 Glittering interiors and gorgeous pagodas remind you that this city has a long history – even if it’s just now opening up to tourism. 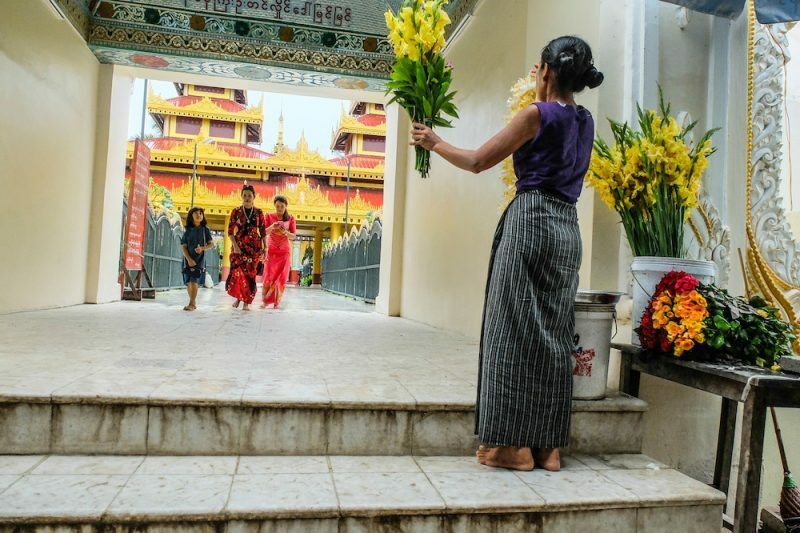 A woman sells flowers to visitors in Mandalay, wearing the traditional longyi (fabric tied to make a skirt) that both men and women alike wear. 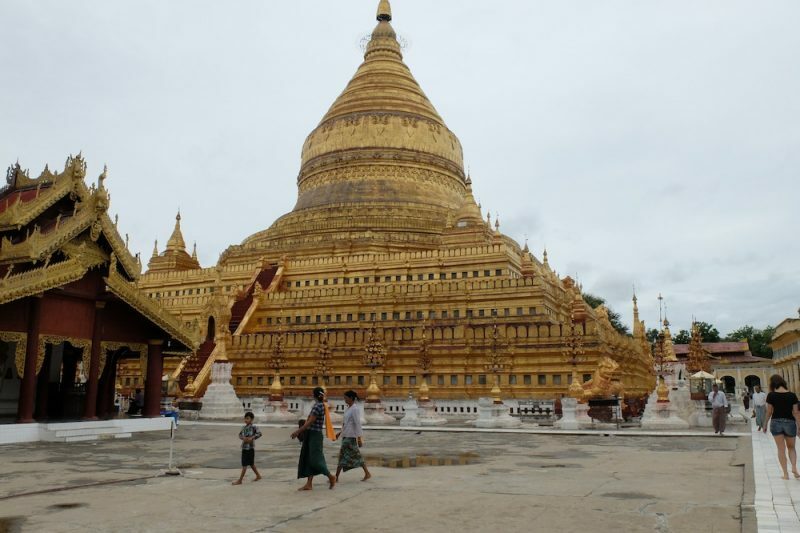 I’m heading to Myanmar in the new year and this post has got me really excited about my upcoming trip!